Fourth release from the remarkable and popular duo continues to explore extended songform - fourteen tracks of soulful grooves moving on via jazz and through to electronics and abstraction. The music on this collection features exciting players from both jazz and rock backgrounds, and pays a deliberate homage to the heady days of musical collision and exploration when pushing the envelope as wide and as far as possible was a given rather than an exception. Martin Archer says: "We'd like the listener to think of this work as being part of a lineage which builds not just on all the music we've both made over the last decades, but which might also include major statements such as Centipede's Septober Energy, Soft Machine's Third, or Carla Bley's Escalator Over The Hill.That's the scope we're chasing." There's a thirst both to explore and to communicate in evidence here - play it loud and feel it. Trance-like and soothing, The Beckoning builds in layers as Julie’s multi-tracked and looped voice rises then eventually subsides, to be replaced by a gently contemplative guitar flurry that sees out the song. Occasionally Julie’s voice, always portraying the cares and wisdom of a life well lived, combined with Martin’s and the other musicians’ spacious jazz and electronica puts me in mind of Joni Mitchell in her mid-70s Pastorius phase. This thought occurred to me during the ethereal Firefly, a highly poetic depiction of love and the spark of attraction, and typical of the high quality of Julie’s lyrics. She writes from the soul, discussing matters of the heart, love and lust, defiance, separation, redemption, wonderment, all in a conversational style as if sung into a mirror. These words can be transitory and impressionistic, and like all good poetry leave the listener to make his or her interpretation. Whereas some of the duo’s earlier albums have at times seemed wilfully obscure, the odder moments onVestigium are simply effortless, and just “be”, in the most Zen-like manner. As a result this album is a triumph of intelligent songwriting and intelligent arranging that will enthral any adventurous listener. Heard the story about the pop singer who quit the business at the height of their fame in the late 60s, and went on to release a sequence of artistically ambitious albums over the intervening decades? While Scott Walker fits the description it applies also to Julie Driscoll. After her marriage to UK jazz musician (and sometime King Crimson collaborator) Keith Tippett, she embarked on an extraordinary musical reinvention. If your only frame of reference is This Wheel’s On Fire, her 1968 hit with Brian Auger’s Trinity, thenVestigium will be a shock to the system. Her beguiling cool and soulful fire remains intact from that era. This fourth collaboration with multi-instrumentalist Martin Archer features a seductive, exotic soundworld that both cossets and challenges Tippetts’ intricately layered vocals as they accrue and converge into startling harmonies. Over two discs, her words ricochet off sub-strata pulses, terse ambient shifts and urgent beats. Poetic cadences glower and fret amid luscious swarms of simmering brass, buzzing double bass and darting acerbic electric guitar. An intense, shapeshifting tour de force, it could well be her best since 1975’s classic Sunset Glow. – Sid Smith, PROG. Vestigium is the latest collaboration between Martin and vocalist Julie Tippetts. Every release in their series of works seems to magically rise above the previous set. This is no mean feat as each of their projects are quite wonderful affairs. This latest set is no exception as the individual works often vary drastically in their sound but manage to create a bigger picture which holds all of them together. Sonic backdrops can be minimal and shimmering with the vocal lines drifting through the landscape. Other times, a steady bassline and percussion beat bring the funk to the fore. All in all… it has an almost magical aura, a very special, intense atmosphere, supported by Julie Tippetts’ wonderful voice. Most impressive is the closing "Stalking the Vision", with an extremely dense and complex arrangement which slides with intensity around the speakers. Terrific! 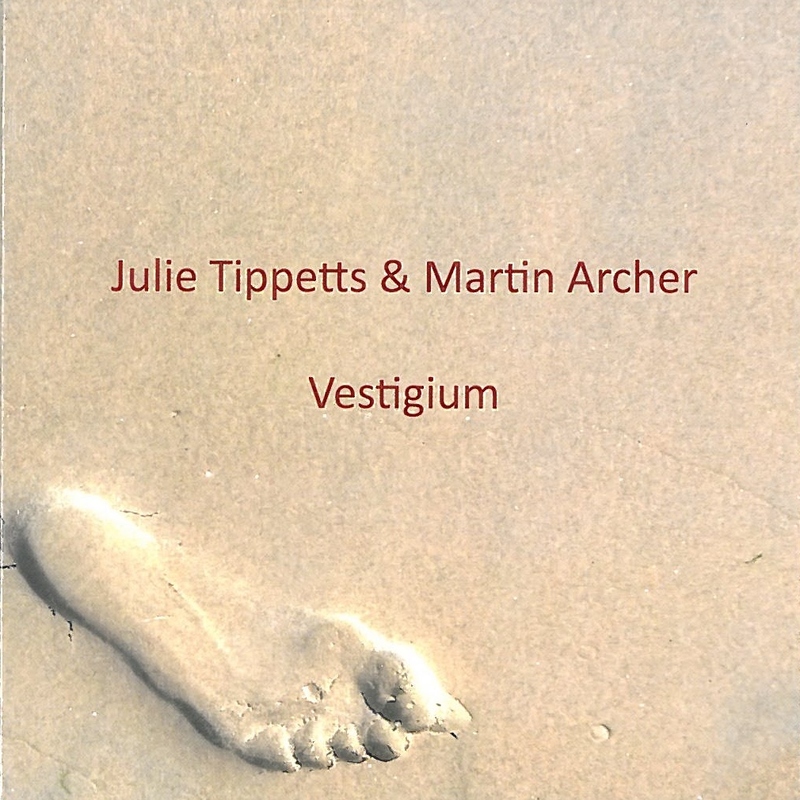 Well established duo Julie Tippetts and Martin Archer bring us their fourth release -Vestigium. This fourteen track album delivers an eclectic collection of grooves, spoken word and abstract electronic ideas. The description may sound incohesive, but the journey Tippetts and Archertake you on is a thrilling rollercoaster. Both Tippetts and Archer have extensive musical experience between them. However, it is the support from the vast collection of musicians that really cements the point of the work. The listener is to be taken down one path with several stop points along the way and each stop stretches musical imagination. The celebration of fusion music was accepted in the past, Tippetts and Archer hope that the listener hears this great history in this present recording. As a fellow vocalist, I was most intrigued by the lyrics at first listen. So many of the words draw the listener in and claim their majestic quality due to Tippetts’s exquisite diction. Each lyric slips off the tongue with grace and conviction. Perhaps this is an observation that reflects my young and naive years, but hidden under each flowing or spiky lyrical phrase, is a basic emotion, action or memory. I understand that this is the general basis for song writers, but it isn’t often approached in such a poetic way. It was the support of Archer’s yearning horn lines that led me to really delve into thewords. The writing, playing, and improvisation, is admirable. As Tippetts fronts the album, Archer is like a swan. His musicianship and phenomenal free playing experience makes the album poised and expansive. Not only does Archer play multiple instruments, he also provides electronic assistance. It’s these eerie effects, which have been expertly delivered not only by Archer, but also from Chris Bywater. This particularly stood out for me inShiver Across The Soul. As Peter Fairclough (drums and percussion) and Seth Bennett (double bass) cement the groove with the laid back feel akin to a Chaka Khan track, the subtle, slightly sporadic sounds which hop in and out are, at first, a surprise, but thereafter a joy to search for. This body of work comes in two CD’s, neither side wins first place. I found the first CD, or side A as it is referred to in this case, slightly more contemporary. The vocal techniques were more stretching. This however, does not mean I lost any respect for Side B. I loved the groove-based tracks, especiallyStalking The Vision. This piece not only boasts Tippetts's ear for harmony, but Archer really gets his ‘moment’. Towards the end, the horn sings over the vocal line, each a lament in its own right. This album pushes the boundaries of many genres. Not only do we hear the traditions of jazz, whether it is influences of swing, extended techniques, or free playing. We also have the challenge of traditional R&B beats sounding away from the usual rap, or head nodding vibe we’re used to. Tippetts and Archer have done as they set out to do. They’ve delivered a work that could sit well with all ages and could possibly influence single-minded listeners to open their ears to a new genre. Seit Anfang des neuen Jahrtausends machen Julie Tippetts (geborene Driscoll) und Martin Archer gelegentlich gemeinsam Musik, seit Ende des ersten Jahrzehnts in einem Duo-Projekt, welches mit "Vestigium" im Frühjahr 2015 sein viertes Album vorlegt. Nachdem Julie Tippetts in den späten 60er und den 70er Jahren des letzten Jahrhunderts musikalisch sehr aktiv war (mit Brian Auger & The Trinity, auf Werken ihres Ehemannes Keith, oder auch solistisch), wurde es in den 80er und 90er Jahren stiller um eine der bekanntesten Stimmen des britischen Jazz(rocks). Seit einiger Zeit ist aber wieder mehr von ihr zu hören, u.a. recht progressive Klänge, wie sie auch das Projekt mit Archer bietet. Um Spuren geht es hier offenbar, ziert doch auch das Cover solche im Sand und ist das die Übersetzung des lateinischen Titels. Es gibt viel Text auf "Vestigium", der allesamt von Julie Tippetts verfasst (und vorgetragen) wurde und sicher ähnlich komplex ist, wie die Musik. Da der Rezensent sich aber kaum mit Texten befasst und ein ziemlich ausschließlicher Klanghörer ist, sei hier nicht weiter auf diese eingegangen. Doch sollten auch anspruchsvolle Texthörer von diesem Werk angemessen unterhalten werden. Also zur Musik! Das Hauptanliegen der beiden Protagonisten ist nach eigener Aussage "to explore extended song form", also ausgedehnte Liedformen zu erforschen. Das geschieht auf "Vestigium" auch. Eine Sammlung an Songs stellt das Album in der Tat dar, bestimmt von der wunderbaren, mitunter rezitierenden, meist aber voluminös, wenn auch immer eher ruhig, bedacht, fast delikat erklingenden Altstimme der Tippetts. Sehr vielseitig, bisweilen auch mehrstimmig, eindringlich und glasklar ist ihr Vortrag, scheint sich ihr Organ in all den Jahren seit den Zeiten mit Auger kaum verändert zu haben, kommt vielleicht noch eine Spur variabler, tiefer und intensiver daher. In allerlei Klang ist Tippetts' Stimme eingebettet, der sich irgendwo zwischen Jazz, Blues, Rock und Freiformatig-Elektronischem bewegt, oder meist als eine Mischung dieser Ingredienzien voran gleitet. Eine umfangreiche Schar von Mitmusiker sorgt neben dem instrumentalen Kern aus Archer (Tasten, Gebläse, Elektronik) und Fairclough (Schlagzeug und allerlei Perkussion) für Farbe und Abwechslung. Sehr elektronisch ist die Basis der Musik, geben oft fiepende und brummende Muster eine rhythmische Grundlage vor, über der umfangreiches weiteres Klangeschehen stattfindet: Perlende Tasteneinlagen, Keyboardflächen, elektronisches Wabern und Wogen, jazziges Rohrblatttröten, allerlei Perkussives, bluesige E-Gitarreneinwürfe, jaziges Rocken, Bigband-Blech und Streichereinlagen. Meist bewegt sich die instrumentale Komponente in eher freien Bereichen, wird es nicht selten schräg und kompliziert, ab und zu auch wüst und hektisch. Das Ganze ist also letztlich keine leichte Kost (insbesondere über mehr als 80 Minuten hinweg), bleibt dabei aber doch erstaunlich zugänglich und rund, gibt es häufig ruhigere melodische Inseln und überraschende stilistische Wendungen (man höre z.B. "Clutching at dust", welches plötzlich zu einem bizarren Reggae oder Ska gerät). Alles in allem verbreitet die Musik, hat man sich einmal eingehört, eine geradezu magische Aura, eine sehr spezielle, intensive Atmosphäre, getragen von Julie Tippetts wunderbarer Stimme. Am beeindruckendsten ist dies wohl im abschließenden "Stalking the vision" zu erleben, das ausgesprochen dicht und komplex arrangiert, sehr intensiv, klangvoll und rund aus den Boxen gleitet. Grandios! Věřil jsem jí jako éterické Julii Driscoll, když vystoupila v roce 1968 na Bratislavské lyře (včetně pozdějšího zahořekování nad okupací Čeaskoslovenska). Věřil jsem jí jako Julii Tippetts , když se vyvázala z populární hudby a po boku svého manžela, avantgardního klavíristy Keitha Tippetta, se stala jednou z nejpozoruhodnějších vokálních experimentátorek. A věřím jí i dnes, kdy spolu se svým současným hudebním partnerem, klávesistou, elektronikem a všestranným konspirátorem Martinem Archerem vydala na Discu (po Ghosts of Gold, 2009, Tales of FiNiN, 2011 a Serpentine, 2012) už čtvrté album Vestigium. Zpívá tu své niterně vytvořené a niterně prožívané texty ve vlastních aranžmánech, je s Archerem spoluautorkou hudby a kromě Archera ji na dvou deskách doprovází bubeník a perkusista Peter Fairclough, kontrabasista Seth Bennett, kytarista Gary Houghton, flétnista a saxofonista Michael Somerset Ward, tedy známá ekipa hudebníků, podílejících se na většině Archerových projektů, a dalších osm muzikantů s různými nástroji od trubky po violoncello včetně laptopu a elektroniky. Stopy bosých nohou, které vidíme na obalové ambaláži, nejsou náhodné. Sugerují nám fakt, že Julie Tippetts je ve svém projevu „bosonohá“, tedy bez zbytečných přísad a šminek. Dovede totiž okamžitě vzbudit křehkou a zároveň vzlínavou náladu, jemně se vetře do našeho povědomí a omámí nás, její škála sahá (bez jakéhokoli razantnějšího vynucování) od kolébavé něhy po zdůrazněné vypravěčství, při kterém záleží na každé slabice, svěřuje se nám, vybízí nás („Pij mě…“), výdešně utajuje, co nemá být dořečeno, ale pak se opře do několikapolohové, dialogizující sběrnosti, je rozdvojená, dramatizující, podbouřněná, zdůvěrňující, položalující, balancující, neoponuje si, nicméně svá témata zaoponovává, zaviřuje, zasutinovává. A hudba to vše se špetkou orientálničení a s odbíjeným mrskutem podmalovává, jemně temperuje, prolíná, elektronika drobátko narušuje pravidelnost a koriguje jednoznačnost nálady, jde v podstatě o vzájemné obalamucování zpěvánek a hudebnostnění, avšak zároveň o střídmou provázanost poetičnosti, (roz)vrativosti, žalnosti. Quatrième collaboration entre Madame Tippetts et le saxophoniste qui a ajouté à sa panoplie, et ce depuis fort longtemps, le traitement électronique et les effets permis de la technologie moderne à travers les ordinateurs. Mais ce premier disque (double, donc) prévaut par un travail acoustique enluminé par quelques effets ("Shiver across the soul"). Et, par-dessus ces lignes somme toute mélodiques, plane la voix de Julie. Une voix que l’on connaissait dans des albums comme "1969" ou "Sunset Glow", enregistrés avec le haut du panier des musiciens de jazz typiquement anglais (Keith Tippett bien sur, mais aussi Elton Dean, Louis Moholo ou Harry Miller). Une voix qui sait vous raconter des histoires poétiques à souhait, qui s’insinue, se faufile dans les interstices construits lentement par couches successives, des nappes sonores montées comme de la crème fouettée, une voix proche de cette de Robert Wyatt ("The Beckoning"), le tout dans une finesse extrême, avec un souci du détail étonnant, multipliant les lignes qui s’enchevêtrent. Ce morceau est magnifique. "Ashen" se développe sur un thème oriental balayé de stridences électroniques.